Blue-winged warblers, like this male, are yellow with blue-gray wings, two white wing bars, and a black eye-stripe that looks like a narrow mask. Females look similar but their color is duller and their eye-stripe is slate gray instead of black. These small, quick insect-eating birds migrate from Mexico and Central America to arrive in old fields in our area in May. Look for them at the Westboro Wildlife Management Area, Gilmore Pond vicinity, and trails along the shores of Lake Chauncy. It’s spring, and for many birds the spring migration is in full swing. At this time of year Westborough turns from a wintering ground for certain birds, such as juncos, white-throated sparrows, and golden-crowned kinglets, into a stopover place or breeding ground for others. Like the human commuters who swell Westborough’s daytime population and crowd our roads, these long-distance commuters increase Westborough’s springtime bird population as they either pass through or come to stay a while. 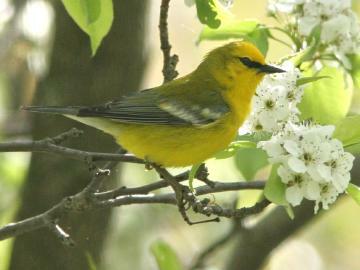 One such traveler is the blue-winged warbler, one of those tiny, fast-moving insect-eaters known as wood-warblers. Blue-winged warblers (Vermivora pinus) are small yellow birds with blue-gray wings, two white wing bars, and a black eye-stripe that looks like a narrow mask. Males and females look similar, but females are a bit less bright. Their eye-stripe is likely to be slate gray rather than black. May is the time for blue-winged warblers to arrive or pass through, but to catch sight of one you’ll probably need to venture into a formerly agricultural landscape or the nearby wooded edges. Because they eat insects (especially at this time of year when caterpillars are hatching), they’re not feeder birds. Find blue-winged warblers in overgrown, shrubby areas near water in places like the Westboro Wildlife Management Area, Gilmore Pond vicinity, and trails along the shores of Lake Chauncy. Places near water – where insects flourish – and blossoming fruit trees – where caterpillars are common – attract them. With a name like “warbler,” you might expect a musical song, but blue-winged warblers (and a number of other warblers) have a buzzy song. The blue-winged warblers’ typical song is often described as a soft, high-pitched, two-note “beee-buzzz.” These little birds actually have two songs. One is for attracting females, and this is the “beee-buzzz” we usually hear. Another is for their dawn song and for warning off rival males. Are these blue-winged warblers just passing through or coming here to nest? Some at least are believed to breed in town at places such as the Westboro Wildlife Management Area. Blue-winged warblers are birds of abandoned agricultural fields that are becoming shrubby areas, and the surrounding nearby woodland edges. They nest on or near the ground in these overgrown areas. They usually get busy defending a territory, pairing up, and nesting as soon as they arrive. They also leave promptly after they’ve raised a brood. We barely have time to realize they’re here. By mid-July to mid-August they’re already wandering southward toward wintering grounds in Mexico and Central America. On their long commute they typically make the dramatic flight across the Caribbean Sea. On their wintering grounds in Central America, blue-wing warblers specialize in finding insects in large curled dried leaves. They probe dead leaf clusters with their thin bills and open them, just as they probe and open buds in our area. Blue-winged warblers have been expanding their range northward over the past century, as people across the northeastern U.S. have increasingly given up farming. As blue-winged warblers have moved northward, they have replaced a closely related warbler, the golden-winged warbler (Vermivora chrysoptera), which has been moving northward ahead of them. Blue-winged warblers compete and also interbreed with golden-winged warblers. You’re unlikely to see a golden-winged warbler in Westborough these days. Their densest population in Massachusetts was back in the 1940s, although they are still occasionally seen in the state. The golden-winged warbler is currently listed as endangered in Massachusetts. Typically, it takes about 50 years for blue-winged warblers to replace golden-winged warblers in an area. How does this change happen? Blue-winged warblers are less specialized in their environmental needs for breeding, so they seem to have more staying power. Golden-wing warblers need fields in the early stages after abandonment, but blue-winged warblers can use old fields over a longer period, from the early stages through shrubby stages to young forest. We usually don’t think of animals as interbreeding (unless we think of mules, which come about when a male donkey breeds with a female horse), yet at least 10 percent of bird species interbreed with other species. They producing offspring that are hybrids, as mules are. When blue-winged warblers begin to expand into an area where golden-winged warblers live, the contact between the two types of warbler leads to hybrids. Typically, one common type of hybrid has the genetically dominant characteristics of each of its parents. For example, a hybrid known as the Brewster’s warbler has the dark eye-stripe seen in its blue-winged warbler parent and the white underparts seen in its golden-winged parent. Eventually other hybrids appear that show characteristics that are not dominant in the parents. The Lawrence’s warbler, for example, has the pattern of black on its face that golden-winged warblers have – much like the pattern of black on a chickadee’s face. Eventually, after about 50 years, the hybrid warblers and the golden-wing warblers disappear from the local population, assisted by the change in the environment from recently abandoned field to old field filled with shrubs, vines, and saplings. In spite of their apparent victory during this transition, blue-winged warblers may now be less common in our area than they once were. Their population appears to have peaked in Massachusetts in the 1980s. Humans have played a role in this drama of change in the natural environment. Settlers originally created new, open environments by clearing forests and farming the land. Much of Massachusetts had been cleared by the 1830s and covered with farm fields, pastures, and stone walls. After that, as people gradually gave up agriculture and stopped cutting and plowing their fields, golden-wing warblers moved into the recently abandoned fields. But then people let those environments slip away, by allowing fields to turn into shrub land and eventually young forest. These heavily overgrown environments proved more suitable for blue-winged warblers. In recent decades, people have been removing these environments altogether by turning former farmlands into housing and commercial developments. This process of change is still underway in Westborough. So keep your ears open for the soft beee-buzzz of blue-winged warblers as you walk through fields and power-line cuts, and think of the drama of change in the environment that brought these warblers to Westborough and may now be slowly taking them away.